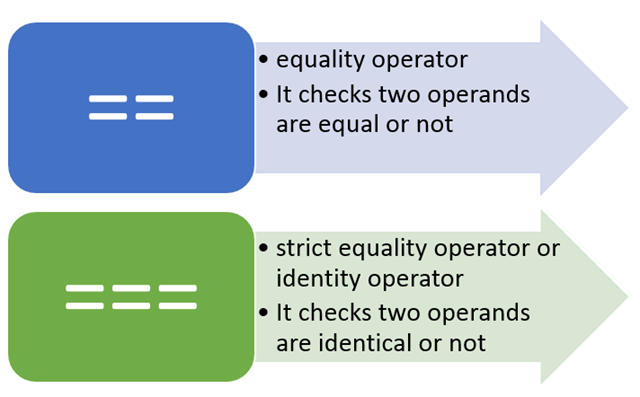 Identical operator or === will first evaluates the operands and perform operation on evaluated value. You will notice as output that === operator will return false whereas == operator will return true while comparing null and undefined. You will notice as output both == and === are returning false. One interesting fact about == is that first it tries to convert string to integer and then it does comparison. So if consider below example, foo1 is string with value 1 and foo2 is number with value 1. == operator will return true on comparing foo1 and foo2 because it first type converts operands and then do the comparison. == And === both operators will return false. Because NaN is neither equal nor identical to any other value including itself. 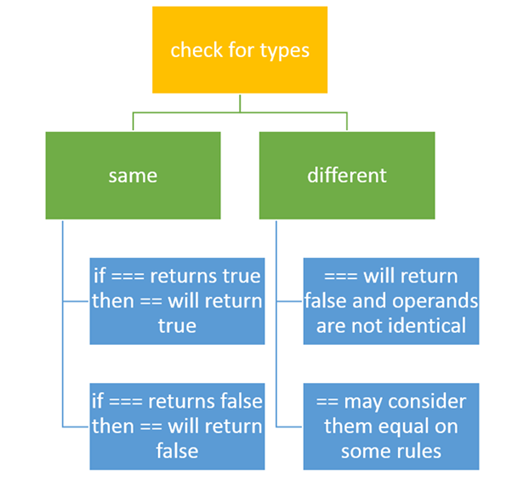 If operand values are getting evaluated to Boolean true or false then they are identical and equal to each other. == And === operators will return true since values of foo1 and foo2 are true. So Boolean true is identical and equal to Boolean true and Boolean false is equal and identical to Boolean false. Two strings with same values are identical and equal. Two strings with different content and length are neither equal nor identical. Two operands represent value of same object then they are equal and identical. If they represent different object then they are not identical but they could be equal. So in other words for operands of different object type === operator will always return false whereas == may return true. If one operand is number and other is string then string gets converted to number and then == compare them.